Have you ever watched Saturday Kitchen and wondered what it would be like to have someone prep all the ingredients for you? To have them measured out into wee containers so that all you have to do is show off your chopping skills and then put everything together? Well, that’s what was going on in my kitchen last night! Have I gone crazy and started using every dish in my house to put together one meal, in a ‘role play gone mad’ kind of a way? No, I’ve signed up for Gousto! Gousto is a meal delivery service that sends you all the ingredients, the exact ingredients, and recipe cards for the meals you’ve chosen the week before. They have lots of special offers to encourage you to try a box, and that meant that four of our meals this week cost £17! UPDATE: Gousto have given me a special code to share with you. It gets you £25 off your first box, and it’s at the end of this blog post! The main reason I signed up was because I realised I’d been cooking the same meals over a two week period for what seemed like, and probably was, months. I was bored, the husband was bored (but not bored enough to take over the cooking…), and something had to change. I’m also convinced, as is my waistline, that my portion control had rather taken off on a permanent holiday. 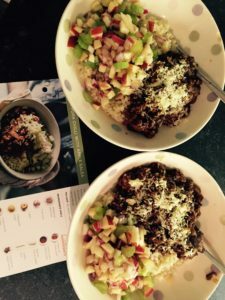 So when I came across an article about Gousto, on one of my ‘I should be writing oh what’s this interesting article’ tangents, I decided to find out more. 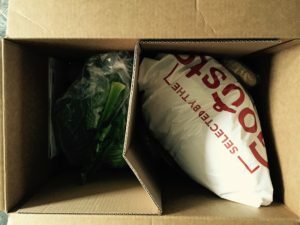 What I like about Gousto is that there’s a choice of recipes; you can vary how frequently you receive a box; they’re very environmentally conscious (more about that later); and they send you the exact ingredients you need, so there’s no waste. The only thing they don’t send you is oil, salt, and pepper. But you can buy those from their marketplace to arrive in your box if you need them. You get a good choice of recipes, and they give you the nutritional breakdown as well as how long it’s going to take to cook. None of them seem to take too long, and the recipes they give you are step-by-step with photos of what it’s supposed to look like along the way. This week we’ve chosen Mexican Chilli Pork with Apple Slaw, Cottage Pie with Spring Greens, Melty Haloumi Vegetable Stew, and Mediterranean Fish Stew. One of the things I was a bit concerned about was how they were going to send the food. They say that they can leave the box outside waiting for you and the food will still be fresh when you get home. That suggested to me that it would come in a polystyrene box, and frankly, there are only so many party wine coolers a girl can use! After that, what’s to be done with a polystyrene box other than let it contaminate landfill for the next five million years?! However my fears were unfounded. Here’s what arrived at my house on Monday afternoon. The cardboard box is made up of 95% recycled materials, and it’s 100% recyclable. On one side you have all the ingredients that don’t need to be kept refrigerated, and on the other, in a plastic, Gousto-branded bag are the refrigerated ingredients. They are being kept cool by two, medium sized ice packs – plastic pouches filled with ice; and a recycled-wool filled bag, which is wrapped around the ingredients and ice packs. The wool bag can be used again, or is fully compostable, and the ice packs are reusable too. Perfect! So far, so good, but what of the ingredients? Are they the kind of thing a discerning shopper would select at the market, or are they dismal, past their best, below par items? I’m happy to say that they’re the former! As someone who is always disappointed by internet grocery shopping, I was delighted with the produce provided. It’s top notch. As you can see, everything is all portioned out. There are tubs with the correct amount of red wine vinegar (for the apple slaw), tomato paste and chipotle paste; then packets of allspice and bulgar wheat. As well as the individual stock cube, cheese stick, and other bits and pieces. The ingredients you’ll need are listed and illustrated on the front of the recipe card, and the steps needed to create the dish are on the back. It’s very simple and I think you’d find it difficult to go wrong. I followed the recipe, all the time thinking that next time I’d probably have to add some more spices because the husband is very particular about his food being tasty. Well, if I didn’t have to eat my words. The dish was delicious! We loved it, and I’m really happy to have added it to my repertoire! The husband didn’t even add any tabasco sauce, which he usually does to any mince dish I cook! It had a real kick to it, thanks to the chipotle paste, and the way it was cooked. I’ve definitely learned some new techniques, as well as how to cook a new dish! We are most certainly out of the rut!! Here’s the finished article: it even looks exactly like it’s supposed to! 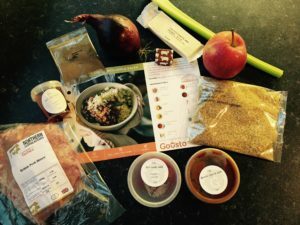 I know this has been a bit of a gushy post, but so far I can see nothing wrong with Gousto’s offering. I’m not sure if they cater for gluten-free, and all of the recipes have some element of gluten in them. Having said that, they’re easily swapped out for another ingredient, so that doesn’t put me off. I’ll ask the customer service lady who’s going to call me later. Yes, that’s right. As if they aren’t already doing everything right, someone called me yesterday to find out how I’d got on with my first recipe. And because I hadn’t cooked one yet, they’re calling me back today to make sure I got on okay. How very cool is that? !